The Cottage Vineyard & Winery is pleased to announce we will have extended hours every Saturday beginning in May 2016. So beginning Saturday May 7th come down during the day anytime and if you like stay till 9.00pm. Please Note: Tastings end at 6:00 p.m. on Saturdays. Glass and Bottle wine and other beverages will only be served after 6:00 pm, no Tastings ok!. So, if you would like to do tastings on Saturday, you must come before 6:00pm. We will also have live music entertainment on Saturday nights for you to enjoy. Hope to see you at `The Cottage` soon. Crane Creek Vineyards sits high in the Blue Ridge Mountains of North Georgia, just three miles north of the quaint college town of Young Harris in the shadow of Brasstown Bald, the state`s highest peak. Less than two hours from Atlanta - yet a world away... Blessed with a unique microclimate, a combination of warm, dry summer days, cool mountain nights and well-drained mineral soils, which allows us to cultivate and harvest grapes that produce complex wines with fresh, assertive aromas and concentrated flavors. Crane Creek Vineyards is a family run business in the truest sense of the word. Members of our small staff are all family members, even if they are not part of my blood family. All of our "family" members have their own specialties and unique personalities, but are all experienced in each facet of the winemaking process and other activities at the vineyard. We may spend one day together harvesting, and the next weekend working at one of our many public or private functions. Each day and each season is filled with rewards as we work day to day with the land, the vines, and the incredible backdrop of our mountain home. Hightower Creek Vineyards is a small, family-operated winery located in scenic North Georgia surrounded by the Blue Ridge Mountains. 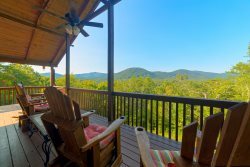 Hightower Creek Vineyards is the dream of Liz and Sanford Green who relocated to Hiawassee, Georgia in 1995 and fell in love with the people, places, and wine of the North Georgia Mountains. The first vines were planted in 2009 with seven acres currently dedicated to production. Located in the Upper Hiwassee Highlands American Viticultural Area, the vines are a mix of old-world vinifera such as Cabernet Franc, Pinot Gris and Merlot, along with native American and French American hybrids such as Norton, Traminette and Vignoles. We planted our first grapevines, a half-acre of Malbec, in May 2005. For the next four years, we added an acre or more of vines each year, experimenting with different varieties, clones and rootstock. Some 3,000 vines now grow on what was once a tired, old apple orchard and pasture. To clear the apple orchard, we attached our tractor and pulled the trees out in early spring, while the ground was soft. After Malbec, we planted more European Vitis Vinifera - Cabernet Sauvignon, Petit Verdot, Cabernet Franc, Petit Manseng, Tannat and more Malbec. Malbec is temperamental and requires constant attention. Cabernet Franc loves our mountains, producing beautiful and bountiful harvests. Petit Manseng is also easier to grow; especially in the higher vineyard that once held apple trees. We have a constant fight with mildew, both Downy and Powdery, and Petit Verdot, Tannat and Cabernet Sauvignon are the most prone. Our first three harvests were from especially warm summers and our Cabernet Sauvignon ripened to lush grapes. The cooler summers with shorter growing seasons since then have produced Cabernet Sauvignon grapes that blend well with a ros�. We`re leasing land off Bridge Creek Road, as you turn into our vineyards, for an acre of Traminette vines, a Gew�rztraminer hybrid that originated in today`s Alsace region in France. Habersham Winery has been producing award winning Georgia wines since 1983 and is one of Georgia`s oldest and largest wineries. Montaluce Winery, Restaurant, and Estates is the first of its kinds in Georgia, a community conceptualized around wine, food, community, and la bella vita. Three Sisters Vineyards sits on 180 acres in the heart of the frogtown district in Lumpkin County, GA. Three Sisters is Dahlonega`s "First Family Farm Winery". Pastoral hillside vineyards, fieldstone-encased winery and hospitality facilities overlook the foothills of the Southern Appalachian Mountains. The Vineyard and Winery provide the perfect setting for the enjoyment of award-winning handcrafted wines, Vineyard Weddings, Sunday Brunch, Cafe Lunch and Gourmet Dinners.